Many Torontonians have come to love Corktown Common, our award-winning park in the West Don Lands. But not everyone knows that this park is also an essential piece of urban infrastructure that’s protecting a vast area of downtown from flooding in the event of a major storm. 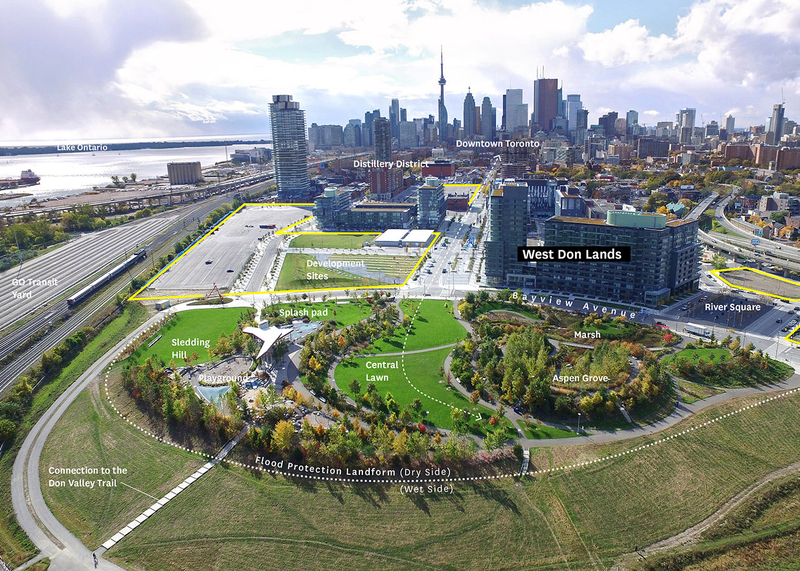 The completed flood protection landform under Corktown Common now protects 210 hectares (519 acres) of eastern downtown Toronto and enabled the emergence of the new West Don Lands community. In 2003, the neighbourhood we know today as the West Don Lands was nothing but a vacant and neglected site. Previously home to a number of Toronto’s most prolific factories and warehouses – including a portion of the Gooderham & Worts Distillery and Enoch Turner’s Brewery – the area was a relic of Toronto’s industrial past. As these industries relocated throughout the 20th century, they left behind a large, empty brownfield site that sat within the designated floodplain of the Don River. This area has a long history of flooding dating back to the 1870s. Because of its unique location at the mouth of the Don River and the Keating Channel, the area was prone to severe flooding under extreme storm conditions – similar to what we saw with Hurricane Hazel in 1954. Under these conditions, rainfall and stormwater run-off along the Don River watershed could cause water levels to rise and spill into the neighbouring areas. Later in 2003, Waterfront Toronto was charged with overseeing the revitalization of the West Don Lands. Before any development could occur, the area needed to be protected from flooding. The revitalization process began by conducting a class environmental assessment to better understand the site conditions and develop a plan for removing the flood risk. The solution: a raised embankment, or flood protection landform, was selected as the best way to protect against floodwaters. Sample cross section of the flood protection landform. Before construction could begin, engineers had to address the site’s unstable ground conditions. Because the Don River used to flow through the West Don Lands before being straightened in 1982, the soil beneath was soggy and unstable. The engineers knew that the soil would shift under the weight of the berm. To avoid this, they completed an interesting process called surcharging, which involved piling large amounts of dirt on top of the site to squeeze the water out of the ground. Once the water was removed, they were ready to begin construction. Extending from Queen Street in the north to the railway tracks in the south, the flood protection landform is 775 metres long, four metres high and is made of roughly 400,000 cubic metres of clean soil from across the Greater Toronto Area. Running like a ribbon through its center is a 1.5 metre clay core, which varies in height to prevent water from penetrating through it. It also includes an armoured slope, made up of stones of different sizes that help prevent the clay core from eroding. Construction of the flood protection landform was completed in 2012 by Infrastructure Ontario. The completion of the project removed more than 200 hectares of prime downtown lands, including the Financial District, from the Don River’s flood plain. It is estimated that the flood protection landform removes the risk of more than of $160 million in flood damages in the event of a major storm. Corktown Common now features three distinct landscapes that double as park area and flood protection landforms. We call the eastern edge of the park running parallel to the Don River the urban prairie or “wet side.” It features a gentle slope and walking paths that lead visitors to the Bala Underpass and connects to the Lower Don River trail network and the river beyond. The long prairie grass on this side of the park not only beautifies the area but helps prevent any erosion of the sloped landscape. The “dry side” of the park features a dynamic greenspace shaped by the flood protection landform. Unfolding from the crest of the landform, it opens into lawns and knolls that create flexible spaces for a variety of recreational activities. While this section of the park does not include flood protection measures, it does feature an extensive marsh (1,300 square metres) that connects with the park’s stormwater management system, receiving and treating stormwater runoff from the flood protection landform. The wet and dry sides of Corktown Common form into gentle slopes that meet in the center of the park; this is known as the “crest”. In the event of rising waters from the Don River, the wet side of the park would bear the brunt of the floodwaters, keeping the other side dry. Lastly, there is the northern entrance to Corktown Common. Once visitors pass beneath the merged King and Queen Street bridge, they will find a landscape similar to the previously described “wet side”. This is also a critical portion of the flood protection landform and similarly features long prairie grass. In the face of rising climate change and its challenging affects, our city is in need of sustainable solutions to future-proof itself in an innovative and practical way. The work done in Corktown Common is an excellent example of the innovation that will transform the Port Lands into a lush, greenspace with flood protection features and opportunities for recreational activity.